“Gewż, lewż, qastan, tin, kemm inħobbu lil San Martin” (walnuts, almonds, chestnuts and figs, I truly love St Martin) goes a popular Maltese rhyme. 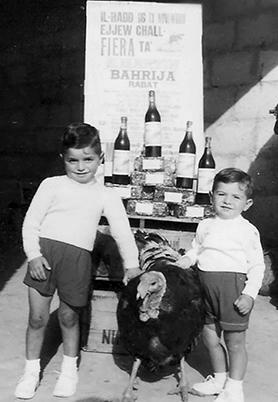 Children posing with a turkey, one of the traditional prizes of the fair ­­– a custom which is no more. Many children would chant these verses as they received a colourful cloth bag full of nuts, sweets and fruit on the feast of St Martin, which falls on November 11. And just as this tradition is associated with the saint, so too is the custom of attending the annual Fiera ta’ San Martin (St Martin’s fair) in Baħrija. The locality is organising its 65th fair on Sunday but its link with the French saint goes back hundreds of years. Baħrija has long been devoted to St Martin, proof of which is the small, old chapel dedicated to him in Trejqet it-Tin and which has been re-inaugurated in 2013 after extensive restoration works. 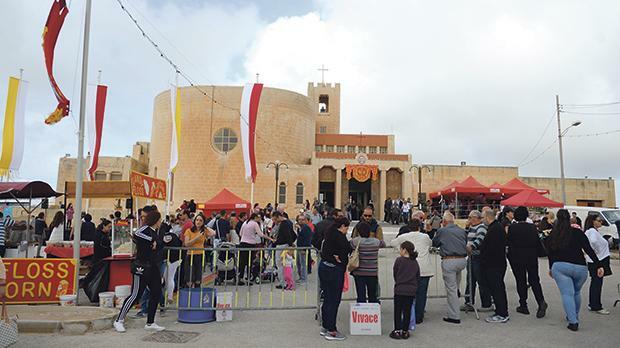 “When Pope Gregory XIII sent Apostolic Delegate and first Inquisitor Pietro Dusina to Malta in 1575, he found a chapel in Baħrija dedicated to St Martin,” said Charles Sammut, one of the organisers of the fair. As the hamlet started developing in the mid-20th century, the need for a bigger church was felt and the first fair was organised in 1953 to raise funds for this cause. 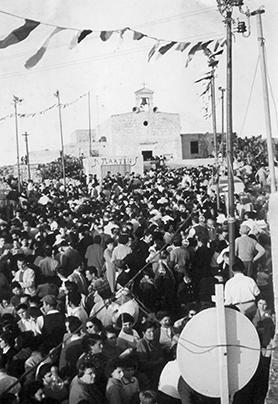 The crowd gathered in front of the Baħrija chapel dedicated to St Martin in the fair’s early days. “When canon Fr Saverin Bianco of Lija became rector of Baħrija in 1952, he realised that the chapel had become quite small for the growing population, so he embarked on an ambitious project to build a new church. “He did a lot of marketing, including adverts on Rediffusion (an early version of cable radio),” Mr Sammut mused. Many wended their way through the countryside to visit the first fair and, year after year, the number of visitors increased. The prime activity in the early days was a raffle through which one could win a lamb or a turkey. 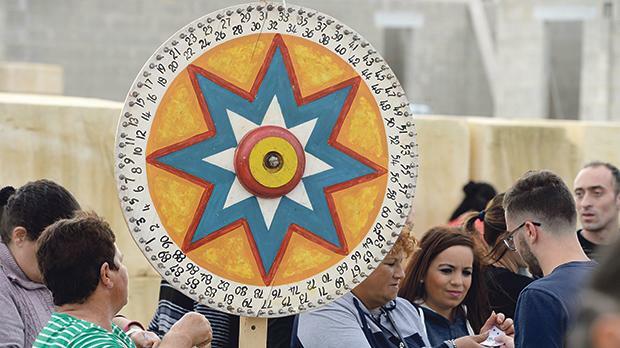 A prize wheel (raddiena) with 90 numbers would be spun to draw the winning ticket. The fair changed scope about three years ago, when the authorities banned the awarding of animals as prizes. 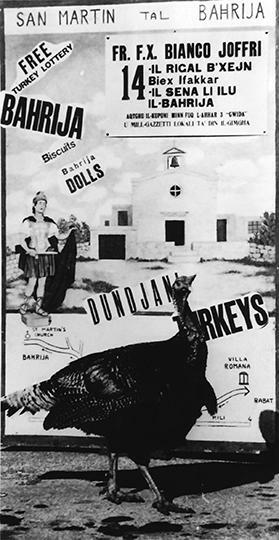 An old promotional poster of the fair. On Sunday, a small eatery will be set up in front of the church. There will also be a children’s area and local singers and dancers will entertain the crowd. The centre of Baħrija will be closed to traffic on Sunday morning and a park and ride system will be operating from the Tal-Fiddien area to the main square between 11am and 5pm. St Martin of Tours (316AD-397 AD) is best known for cutting his cloak in two with his military sword and giving half of it to a beggar clad in rags one cold winter day. This might explain why the saint is associated with generosity and why children were given a simple cloth bag full of sweets, fruits and nuts known as St Martin’s Bag on his feast day. Others say that the reason is that November 11 falls just before Advent, a time of fasting before Christmas for Christians in old days, so children were given one final treat on this day. Children enjoyed not only the goodies found inside the bag but also used the nuts to play a number of traditional games including kastelli (castles), which involved building a ‘castle’ with the nuts. The rich cake is filled with walnuts, hazelnuts, figs, almonds and cinnamon and is traditionally served with a cup of freshly ground coffee. The Maltese islands generally get a spell of unseasonably warm weather (the equivalent of the British ‘Indian summer’) around the feast of St Martin and those daring enough would not refrain from having a swim. 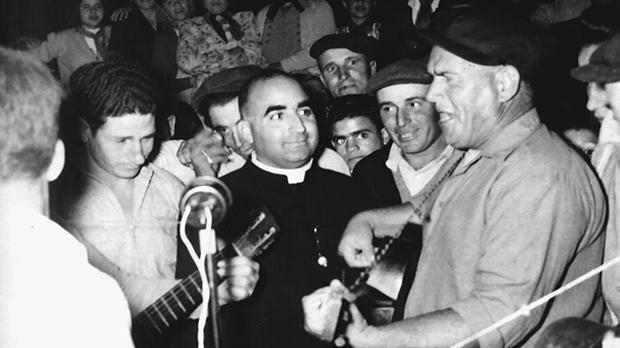 Fr Saverin Bianco who launched the fair in 1953 to raise funds for a new Baħrija church.